Careers in this sector are related to technologies necessary to design, develop, install, and maintain physical systems. 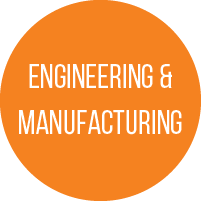 These include engineering, manufacturing, construction, auto and aviation services, and related technologies. Are you mechanically inclined? Do you like reading diagrams and blueprints, and designing building plans? Are you curious about how things work? Would you enjoy repairing or maintaining cars or aircraft, wiring electrical circuits, installing HVAC systems, or woodworking? This may be the career path for you!